Chances are, you barely have time to watch the latest episode of your favorite TV show, let alone hit the gym. You probably feel guilty—after all, you’re wasting a lot of money, plus a sedentary lifestyle can shave years off your lifespan. But if you consistently find yourself working too late to catch a 6:00 p.m. spin class or sleeping through sunrise yoga, you might want to suspend your sports club subscription and brainstorm some creative methods to integrate physical activity into your daily routine. mental_floss spoke with Lindsay Hunt, a certified integrative nutrition coach and personal trainer. She suggested nine easy ways you can get your heart pounding before, between, after, and even during work calls and meetings. 2. STAND UP DURING CONFERENCE CALLS. Take your conference calls standing up, Hunt suggests. 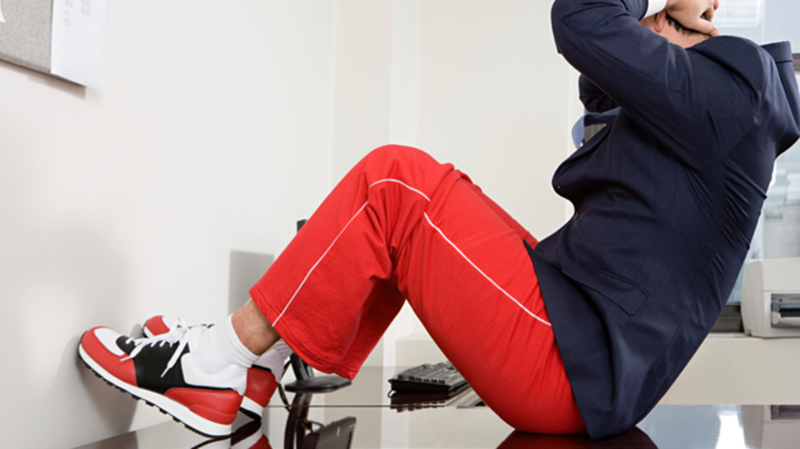 This might not sound like exercise, but by kicking your desk chair to the curb you can decrease your blood glucose levels, increase your heart rate, and, yes, burn more calories than if you remain on your posterior. Case in point: A few years ago, BBC News Magazine teamed up with a group of researchers from the University of Chester in England to conduct an experiment on a group of 10 volunteers. The study's leaders asked participants to stand for at least three hours a day for one week, and they used accelerometers (a movement monitor), heart rate monitors, and glucose monitors to track subjects' physical changes. By the end of the week, the subjects’ heart rates were beating on average around 10 beats per minute higher—meaning they were likely burning about 0.7 more calories per minute. This sounds small, but it adds up to about 50 calories an hour. If you stand for three hours a day for five days, you’re burning 750 extra calories, BBC News Magazine pointed out. Already own a standing desk? Kick things up a notch and get a wireless headset. That way, you can take brisk walks while conducting official business over the phone. And if your meeting’s in person, ask your co-workers to walk around the office with you or through a nearby park. 3. HIDE TENNIS SHOES UNDER YOUR DESK. Bring sneakers to the office and stash them underneath your desk. At least three times a week, pull them on and commit to taking a 20-minute power walk during the afternoon. “Not only will it up your step count for the day, but it's a great way to de-stress and increase energy during a long day at the office,” Hunt says. Studies suggest that only 20 minutes of brisk, daily walking can reduce the risk of early death by nearly one-third, so consider increasing this amount as time goes on. We know, we know—fixing your posture isn’t exactly exercise. Still, “sitting up straight and engaging your core will increase your calorie burning while sitting at your desk,” Hunt says. 5.COMBINE AN ACTIVITY YOU "HAVE" TO DO WITH EXERCISE. 6. WEAR YOUR GYM CLOTHES TO BED. Instead of donning pajamas, wear your T-shirt and running shorts to bed. In the morning, roll out of bed and run around the block. This way, you won’t waste time planning and prepping for your workout. Not a morning person? Don’t worry, Hunt says you’ll still benefit from a 15-minute jog. “It's a common misconception with many of my clients that they must do a full hour of cardio for it to be effective,” she says. “Small bursts of movement or exercise throughout the day can be more effective and burn more fat.” Plus, a short jog will “really wake you up by getting your blood pumping first thing in the morning, leaving you with increased energy and an improved mood," she says. Ever wanted to do a set of real, full-body military push-ups, or hold a 1-minute plank? Spend a few minutes working toward this specific fitness goal before you go to bed each night. “To tackle 15 military push-ups, you could begin by doing 10 push-ups on your knees and end with one military push-up each night until it becomes easy," Hunt explains. "Then, increase to two military push-ups, and then three, four, five and so on... Or you could work toward the 1-minute plank by holding a 15-second plank on Night 1, a 20-second plank on Night 2, a 25-second plank on Night 3, and so on until you work yourself up to a 1-minute plank." 8. PUT YOUR MONEY WHERE YOUR MOUTH IS. It’s easier to skip the gym without guilt if you’re paying a flat monthly fee for unlimited classes. If you sign up in advance for pay-per-class exercise activities (think SoulCycle or Pure Barre), you’re forced to shell out the cash in advance—and you’ll lose it forever if you miss your workout. This will give you more incentive to actually attend spin class instead of blowing it off for wine and Netflix. 9. CREATE AN EVENING WIND-DOWN REGIMEN. The internet is full of quick, instructional yoga videos (for more information, check out this helpful list of popular ones, compiled by New York magazine.) Instead of surfing the internet in bed before you catch some Zs, move your computer to the floor and allow a virtual instructor to guide you through a 15-minute stretch routine. “If you sit at a desk all day, your body will thank you for this, big time,” Hunt says.